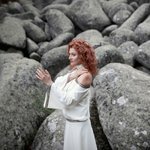 The start of the project dates back to 2009 when Gergana Dimitrova - Belonoga, singer at the Mystery of the Bulgarian Voices and Eva Quartet, together with Alex Noushev, composer and arranger, started working on the first album, Through the Eyes of the Sun. 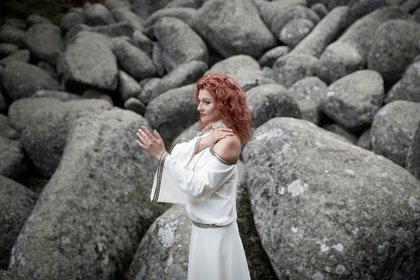 Belonoga’s deep knowledge of Bulgarian music and songs, together with her encounters with the ancient cultures of aborigines and pigmies through the years, led to the accumulation of various musical ideas. Guided by the melody and provoked by the primal impulse, a new and extremely emotionally rich type of music appeared. On one side, it creates a dialogue between the ancient aborigine and pigmy cultures with the melodic patterns of the Bulgarian song. On the other side, vocally-wise, it seeks a direct and primal link with them. What is more, Belonoga goes even further and creates a whole new world of music – a world without borders. The album was released in 2012, produced by Dimitar Panev, representing Elen Music label. 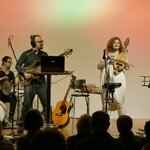 At the same time a live concert project was started with the participation of: Gergana Dimitrova-Belonoga, vocal, Alex Noushev, guitar and electronic instruments, Kostadin Genchev, kaval, Violeta Petkova, gadulka and Peter Todorov:, percussions. From the source of the primary principle of Bulgarian folklore and our own roots, we follow a long and interesting road that has no end. In music we follow a limitless direction full of light. The interlacing of Bulgarian intonations with the musical sounds of other cultures makes us feel that we share the same ground and it is actually the element that connects us. Sometimes it is hard to explain how a piece of music has appeared, but it says a lot about itself and the person who has created it. By Belonoga’s music, one is transported to a new musical world, ancient but at the same time harmonious. 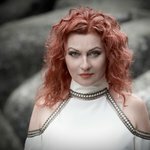 The second album - "Throught the eyes of the Earth" was released in 2018 via Narrator Records (Hungary).